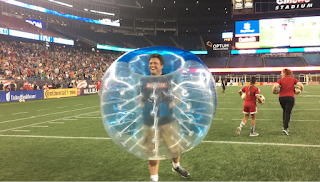 Parental Ideas: I got to play Bubble Soccer at the New England Revolution soccer game! I got to play Bubble Soccer at the New England Revolution soccer game! Last night I went back to Gillette to go the New England Revolution soccer game with my buddy, Yuval. As we were walking into the stadium, we walked by the fan zone and heard over the loud speaker "If you want to play Bubble Soccer, come to the stage" and we quickly signed up. Well, just before halftime we met the two other guys we were going to play against and put on the inflatable bubbles and then ran out onto the field. They promptly announced us on the loud speaker and then we started... We continued to "play" soccer for 3 minutes and I just tried not to fall down and end up flipped over. I was pretty lucky - not only did I not fall over, but I even scored a goal and with Yuval's goal, we ended up winning!